Look, I'm not going to print out the recipe, I know it by heart. We eat this every week. And every week I place this meal down in front of salivating Kochs, because it is absolutely delicious and everyone in our family loves and devours it. Like every episode of The Office, it never grows old. It's from one of the best cookbooks ever made, The Best 30-Minute Recipe from Cooks Illustrated and you need a copy (it's even on sale!). You'll never need one again for weeknight meals. And everything by Cooks Illustrated and America's Test Kitchen is da bomb. You need no one else. 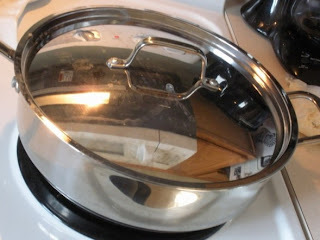 Sweet CI/ATK, I love you, I marry you as my one and only cooking-loves for the rest of my cooking-life. 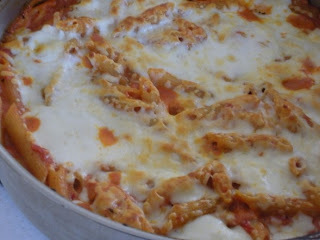 Skillet Baked Ziti. You'll find that on pg. 140, peeps. Nope, still don't have the book here. I just know. Go get the book. I'll share some highlights here. Preheat the oven to 450. In a cold, oven-safe skillet, add olive oil, 6 cloves of garlic minced, 1/2 t salt and 1/4 t red pepper flakes and heat together over medium high heat. Heat and stir until fragrant, about one minute. 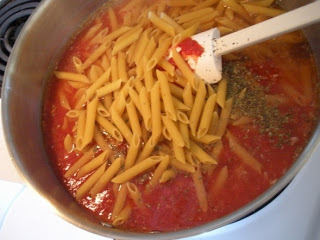 Add 3 C water, 28 oz crushed tomatoes, 1/2 t salt, 3 3/4 C ziti (or penne) and if you have fresh basil you can chop it and put it in in the end, but I always use dried, so I add it here- about 1/2 t or so. I just dump. Also, we always used 100% whole grain pasta, but when things got really tight with Jim's commute (over twice as much on gas now since we moved) I had to let some things go. That was something I could let go for this meal. I got a humongous bag of penne at Sams- was it about $5? There's enough for like, ten meals or so in it. I can't remember, but, it's cheap. Everything else we eat is still all whole grain. This won't kill us. Stir it up. 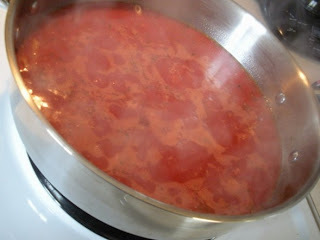 Bring to a simmer, cover it and stir it often for 15-18 minutes- lower the heat but maintain a vigorous simmer. That's right folks, it's just that simple. The pasta cooks right in the good stuff. And so it is with the Best 30 Minute Recipes- that ain't no lie. They mean 30 minutes, and they really are super easy. And all home made, with just a few purchased pre-mades as you need them, like tortillas etc. But they do tell you how to make your own...if you want... You can do it. It's simple and you'll get the hang of it fast. You will never go back. Your food will be way better, your family much healthier. That, my friends, was a tangent. And after the stirring and waiting... and by the way, in those 15-18 minutes you have time to get the whole kitchen straightened up again while you're waiting... Here it is- beautiful and ready for the next step. Add 1/2 C parmesan cheese and 1/2 C Heavy Cream, and salt and pepper to taste. Cover it with 1 C of shredded Mozzarella. Bake it in the oven for 10 minutes, until the cheese is all melted and slightly browned in spots. Agh! This stuff is the best! 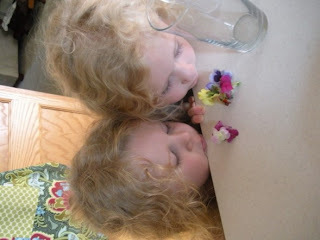 While I cooked, Jim had the kids outside and Grace and Pate brought me some flowers. I just say NO to rotating this week, apparently. Wow! What a great recipe! I adore, love, find GREAT happiness in one pot meals. The less dishes I have to wash the better!! I love Cooks Illustrated also with the exception of their marketing department. They were SO aggressive! 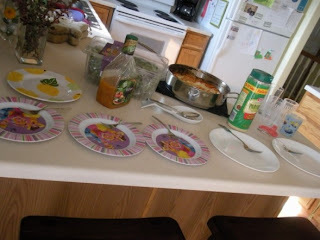 BUT I love yummy meals that everyone will eat that are not too pricey. I have to say, I'm loving these question answering posts! So fun!!! 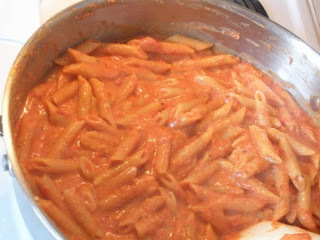 Ziti is one of our all time favs! Justin LOVES it. But my recipe is different than yours, I am so trying this one! One pot is awesome!! Mmmm... that looks really good! Who doesn't love a one pot meal...well I guess if it taste lke garbage but I cannot wait to try this one. Here's a question for you - are crushed tomatoes the same as diced tomatoes? What a delicious recipe! I'm going to have to try this one soon. 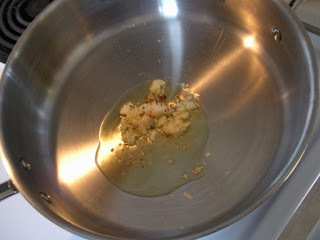 Um, how do you mince garlic? Do you use the already minced version or mince it yourself? And, asking my husband about buying this cookbook, it might save our marriage or my sanity! Can't wait to try this recipe! Love it! I just love how generous you are in sharing your ideas with us. Fabulous! Thanks for the great recipe to add to my collection. I love the photos you add to your posts...makes it so real. I LOVE the ?M segment...keep'em comin'! Oh, where did you find the cookbook on sale? what would my belly do without you?? I will be cooking this one, you can bet on it! Looks YUM! Found the crushed tomatoes at Hy-Vee. 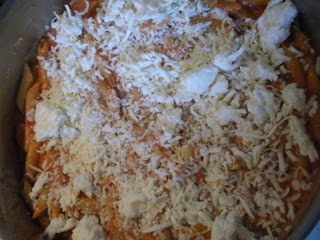 Baked Ziti Megan style is on our menu for Wednesday night - hooray! Oohhh...that sounds yummy, and I am putting that cookbook on my request list from the library RIGHT NOW! 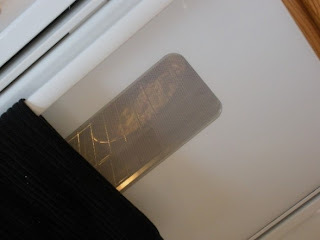 Ok, I am finally caught up with your blog. I have so much to comment on, but I forgot it all already. You have a great take on life, my friend. I hope you got rid of the ants! ick! Alright Megan I am going to give it a try. 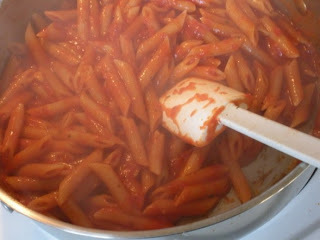 We don't normally like red sauce on pasta, but this looks yummy enough to try. 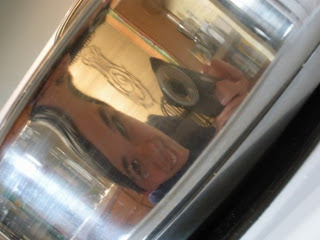 LOVE LOVE LOVE the picture of you in the pan~ you are so funny! Hey, I made this tonight. It was *awesome*! "Ah, delightful Baked Ziti. You had me at '6 cloves of garlic', but when I got to the dumping in of parmesan and heavy cream, I knew our was a love that would last 'til the stars grew cold". If you couldn't tell, I made this for dinner tonight. yum, yum, yum. Welcome to our rotation! We just had this for dinner tonight - my parents were even here. We loved the recipe. I've asked for the recipe book for my birthday. I think Shari is getting it for me. Yum yum!